This review appears in the February issue of the (Jewish Federation of Collier County, Florida) Federation Star. 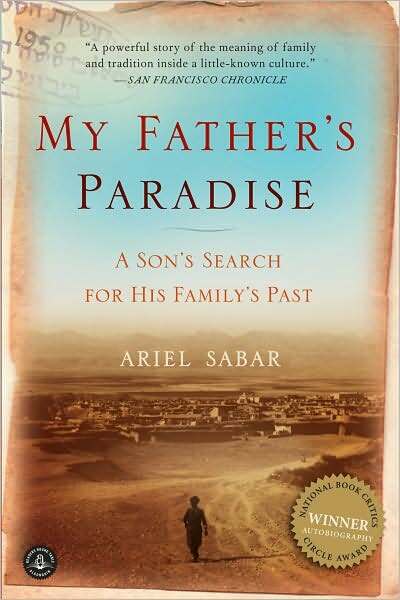 “My Father’s Paradise,” by Ariel Sabar. Algonquin Books. 344 pages. $25.95 (hardcover), $14.95 (paperback). This fascinating, harrowing, and uplifting book, subtitled “A Son’s Search for His Family’s Past,” is one of several recent books that portray lesser-known strands of Jewish history and identity. These include Lucette Lagnado’s “The Man in the White Sharkskin Suit: A Jewish Family’s Exodus from Old Cairo to the New World” and Dalia Sofer’s novel “The Septembers of Shiraz,” detailing the effects of the Iranian Revolution on a prosperous Jewish family. Ariel Sabar, like Lagnado a working journalist, takes us through four generations of Kurdish Jews, beginning with his great-grandfather’s world. Along the way, he presents a riveting overview of Middle-Eastern history. Zakho, then a small, desolate frontier town in mountainous northern Iraq near the Turkish border, was a place where Jews, Muslims, and Christians lived in relative harmony. Bonded by an overarching Kurdish identity and by the ancient, vanishing Aramaic language, these Jews kept their heads down but managed lives of relative freedom. Geographical isolation played a part in maintaining this “paradise.” Here Ephraim Beh Sabagha, the dyer of Zakho, lived his life as a respected working man and as a holy man who communed with God and shouted out in exaltation to spirits and biblical figures. The harmonious existence of this family in its community continued into the adult years of Mr. Sabar’s grandfather, Rahamim, who prospered as a businessman along with his brothers. Yona, Rahamim’s son, had his bar mitzvah a year early, just ahead of the Bathist regime’s excesses that led to a huge immigration of Iraqi Jews to Israel in 1951. Sabar observes how the birth of the modern Jewish state in 1948 damaged the peaceful coexistence of the various Sons of Abraham. Simultaneously, the repression of the Kurds accelerated the decline of Aramaic as a living language. Successful Kurdistanis like Rahamim found themselves second-class citizens in the wished-for paradise of Israel, trapped in shabby neighborhoods and menial occupations. The ruling class Ashkanazi prejudice against Sephardi and other Jewish strands was especially strong against the Kurds. This immigrant group led lives of humiliation and despair; however, their children slowly made advances in the melting pot society. One such child, Ariel Sabar’s father Yona, succeeded in school and gained access to higher education – first in Israel, and then in the United States on a graduate school fellowship to Yale. The story of Yona, the narrative’s twice-displaced hero (the second time by his own choice), carries the theme of blurred identity. 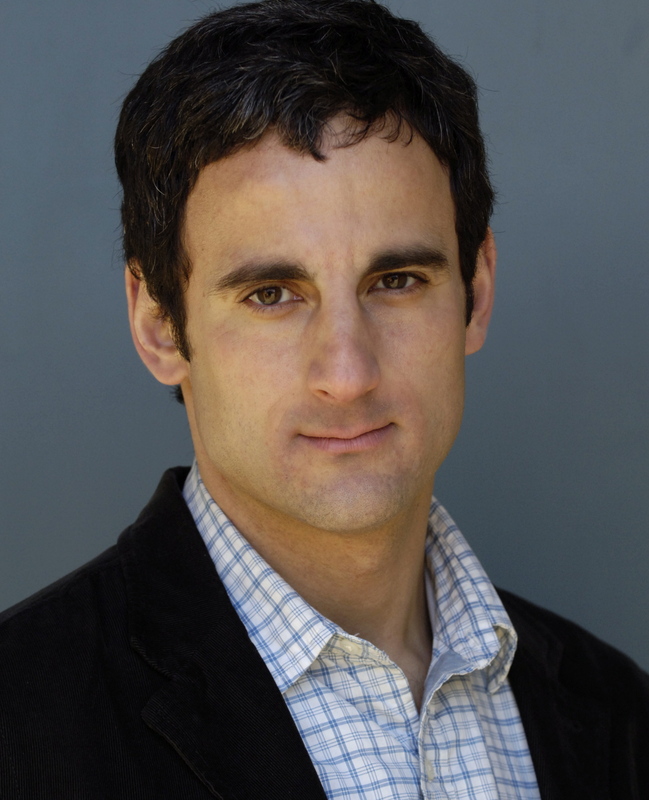 He marries an American Jew and obtains, after some years of non-tenure track academic employments, a position at UCLA and a home in middle-class Westwood. Yona’s career in this latest paradise involves research into Aramaic, his native language, its vocabulary slipping from his memory even as he becomes an internationally-recognized authority on its history, intricacies, and the culture that it conveys. Yona accepted his opportunities, escaping his parents’ world of shame and regret. Or did he? He dreams of Zakho. He remains a foreigner in California. His manner, style, and accented, non-colloquial English render him a target of scorn to his son, American-born Ariel. Ariel Sabar’s gradual transformation from resentful, disrespectful youth to ardent keeper of his father’s, his family’s, and their culture’s honor, stories, and traditions is the book’s final stage. The author has set and met an astounding challenge – magnificently. This article appears in the January 13-19, 2010 issue of the Fort Myers Florida Weekly. 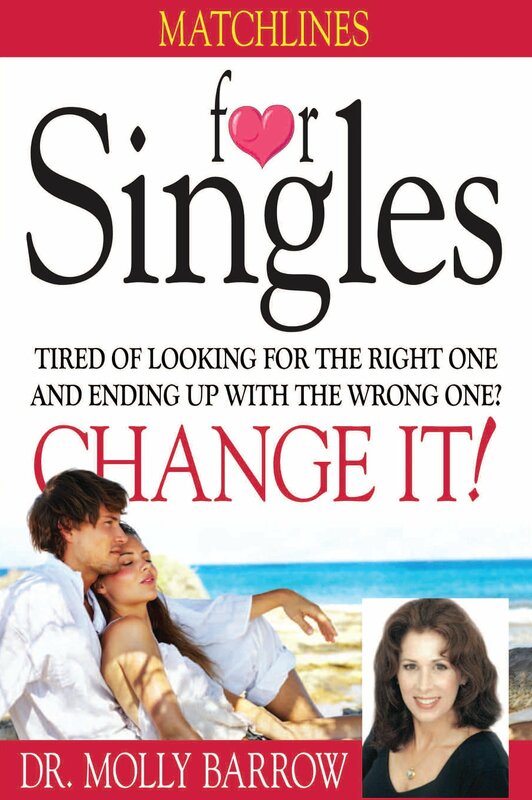 It is available at Florida Weekly – Barringer Publishing. It also appears in the February 4-10 issue of the Naples Florida Weekly. For Jeff Schlesinger, whose advertising and marketing career includes over two decades in Naples, the collapse of home building presented a challenge. Many of his clients are local builders whose misfortunes have been his as well. After researching new ways to apply his talents and experience, Mr. Schlesinger made a surprising choice: book publishing. Most failed publishing endeavors, he believes result from faulty marketing – and marketing savvy is Mr. Schlesinger’s forté. Barringer Publishing, a name that combines his own last name with that of his wife – psychologist-author Dr. Molly Barrow – is a full service publishing house that guides authors through four major steps: publishing, marketing, graphics, and advertising. For Jeff Schlesinger, however, marketing considerations embrace the entire process. Authors who do not want piles of books in their closets need carefully designed plans that target potential readers and turn them into buyers. With a background in art, Mr. Schlesinger feels that his creative side is responsive to the needs and aspirations of authors. He savors the preliminary conversations that eventually build the author-publisher relationship. Mr. Schlesinger entered advertising from the perspective of graphic design, and he steps into publishing with both that interest and decades of marketing know-how. “Publishing,” for Jeff Schlesinger, includes editorial assistance, cover design, interior layout and design, and printing. A book’s appearance must attract attention and provide a message. The impact of the cover and the power of the title are essential marketing decisions. So are decisions about manufacturing quality, distribution channels, and pricing. Each book’s price must include a percentage allotted to marketing costs. “Marketing” includes public relations, media contacts, review copies, mailings, press releases, networking (electronic and otherwise), and speaking engagements. Branding the author as an expert on topics addressed in the book opens up marketing opportunities. “Advertising” goes beyond ad design to include print and electronic media placement. Barringer Publishing works to define the market for a book and reach that market “with the correct message as cost effectively as possible.” Many books have niche markets (“grandparents purchase four out of ten children’s books”), and advertising campaigns must exploit media that truly reach the potential buyers. Self-published authors have the opportunity to make far more money per book than authors who work with traditional “royalty” publishers. However, this opportunity cannot be realized unless the authors receive appropriate guidance and assistance. Jeff Schlesinger developed Barringer Publications to do just that. Published authors unhappy with their books are turning to Barringer Publishing for book makeovers. Makeovers typically include reshaping the book’s content, stylistic smoothing, a new title, enhanced graphics, more astute production and pricing decisions, and – of course – an effective marketing plan. Barringer Publications established its initial list of titles primarily by word of mouth, and interest has spread far beyond Naples, aided by the promise of a 60-day turnaround time and the showpiece titles by Dr. Molly Barrow. Jeff Schlesinger has discovered that there are many good writers in the Naples area, accomplished people with fascinating experiences who are ready to share what life has brought them and taught them. He intends to help them refine their voices, share their stories and insights, and do it all effectively. If a book already in print is in desperate need of a strong marketing campaign, Mr. Schlesinger offers that service as well. For information, write to info@barringerpublishing.com. “Six Months to Dr. – How I Completed My Dissertation in Six Months and Saved Thousands of Dollars” by Dr. Judi Cineas, Ph. D. The title says it all. February. “Seven Soldiers” by Philip Storm. This substantial makeover of a fact-based Vietnam War novel involves seven military brothers, a golden triangle drug operation, and the Congressional Medal of Honor. February. “Why Men Must Lie to Women” by Philip Storm. What types of lies are there? When do men/boys start lying to women, and why are they compelled to become experts in the art of lying? March. “Why Wait? Be Happy Now,” by Donna Daisy, Ph.D. A self-help book answering the question, why wait for something to happen to provide your happiness when you can be happy now? Even people living in dire circumstances can attain happiness by following good advice. March. “The Fighting Ethnics,” by L. C. Goldman. Mountain Valley Publishing. 280 pages. $16.95. L. C. Goldman is the poster boy for productive senior-hood. This 82 year old former advertising executive has launched a flotilla of new careers in Naples. He encourages the seniors that he meets to avoid the armchair and the TV, develop their untapped capacities, and get involved. This whirlwind of Pelican Bay is seemingly everywhere. On January 6, he was scheduled to make his third appearance on Dave Elliot’s WGUF radio show. On February 10 and again on March 10 he will give a lecture called “Advertising Campaigns: Stories Never Told” at the Naples Center of FGCU. Call 425-3272 to pre-register. He is president of the Naples Chapter of the American Technion Society, raising consciousness about Israel’s foremost university and research facility in science and technology. Mr. Goldman invites distinguished Technion professors in various disciplines to speak about their work. L. C. Goldman also moderates “Great Decisions” sessions for the Naples Council on World Affairs, a branch of a national organization. These meetings generate informed, nonpartisan discussions. The Council also offers a series of lectures by foreign policy experts. Not enough to keep busy? 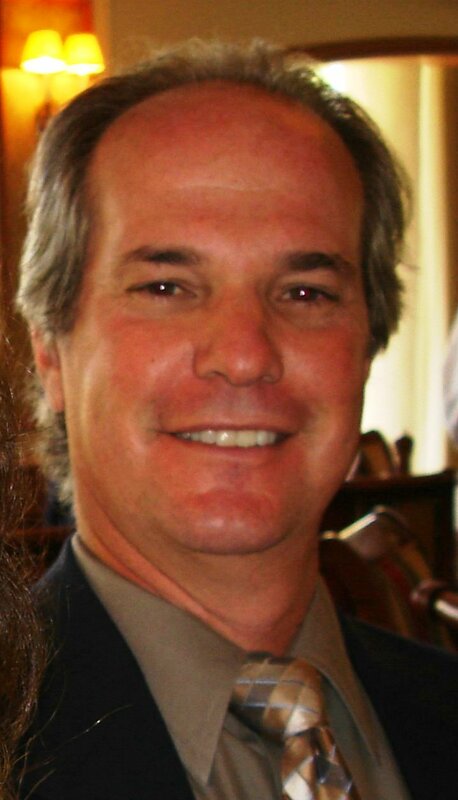 Mr. Goldman also writes columns for both the “Naples Daily News” and the “Pelican Bay Post.” He mixes humor and thoughtful argumentation on a wide range of issues. 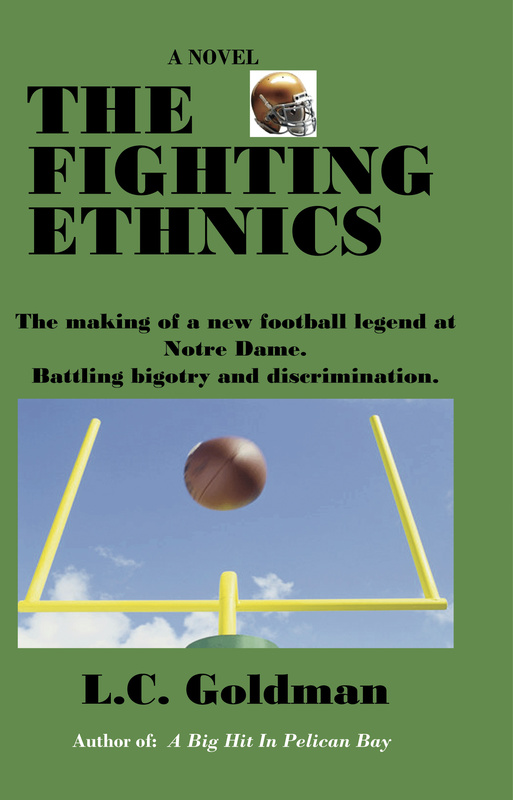 In “The Fighting Ethnics,” three young men – a light-skinned Black, an Italian-American, and a Jew – meet as Notre Dame roommates after hiding their ethnic identities to insure admission on athletic scholarships. They form a powerful bond, fighting against campus prejudices as well as the head football coach’s prejudice against playing freshman on the varsity squad. Mo Greene, the son of Holocaust survivors who are super-sensitive to anti-Semitism, has changed his name from Maurie Greenberg. His father is outraged that his son has betrayed his heritage by entering this bastion of Christianity. Tony Granelli isn’t hiding his Italian heritage, but the fact that his father is a Mafia Don. L J Jones, whose father passed as a white man, is tempted to do the same. Mr. Goldman is at his best when writing crisp banter among the three student athletes. He nails the personality and speaking style of each. He wins the reader over through his portrait of their strong bond and mutual respect, often manifest through the mock stereotyping gibes that they toss at one another. The author hooks readers into rooting for each step in the trio’s success, as they work hard to prove themselves, become starters, and help the football team reach the pinnacle of success. Mr. Goldman’s management of the family tensions affecting each main character, tensions in part resulting from their relationships with seemingly out of bounds women, complicates the story of the football season in engaging ways. There are lapses in credibility, such as when readers learn that a Jewish Kenyan princess has renamed herself after a minor Jewish holiday and celebrates it each year. The holiday, Tisha b’Av (meaning the 9th day of the Hebrew month of Av), is the saddest day in the Jewish calendar and for many a fast day. There is nothing to celebrate. All in all, L. C. Goldman has fashioned a lively, upbeat, and often humorous tale that provides an important perspective on the workings of discrimination. “The Fighting Ethnics” show their stuff as heroes on the football field, but more importantly as valiant warriors in the battle against prejudice. 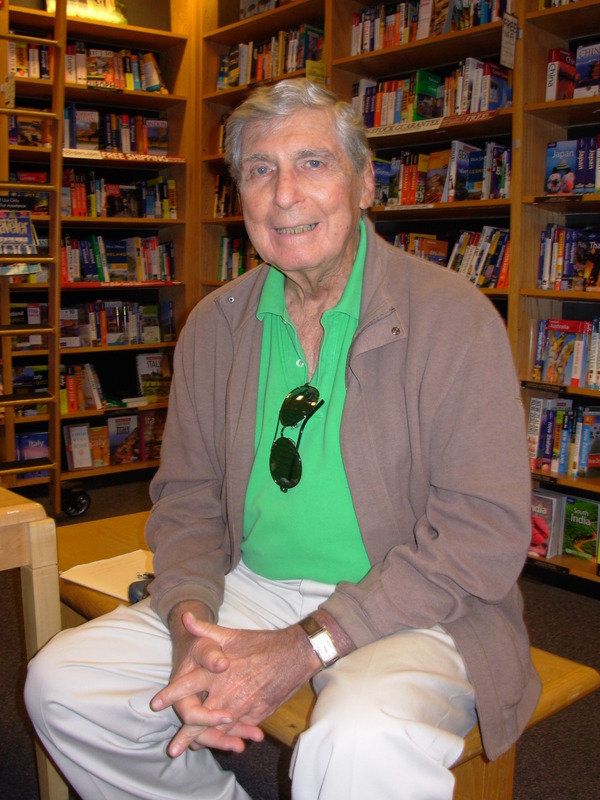 L. C. Goldman signs his new book at the Naples Barnes and Noble (Waterside Shops) on Saturday, January 09. Discussion at 1:00pm, book signing at 2:00pm. Call 598-5200 for information.